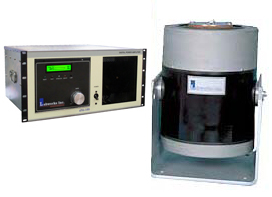 The dLW127.153-500 is the largest of the Labworks vibration test systems featuring our dLAB series high efficiency digital switch mode shaker amplifier. The shaker's large 6 inch diameter armature table makes it easy to adapt to almost any test requirement with a minimum of fixturing. The high lateral stiffness carbon composite armature suspension reduces problems associated with off-center loads and allows unsupported horizontal operation with many loads. The ET-127 shaker is equipped with a degauss coil to ensure low stray magnetic field for sensitive applications. The air cooled dPA-153 dLAB shaker amplifier delivers full system performance while minimizing power and amplifier cooling requirements. The amplifier's multi-function digital display provides amplifier operational status as well as system peripheral and complete vibration system operational diagnositcs. Built in shaker-specific current limiting and full internal, system and external electrical interlock connections and logic help protect the system and test specimen from accidental abuse. Oil film slip table base systems are available for larger and heavier loads or loads with high centers of gravity.